Hugs available here! – Stones, and Tokens, and Hearts, Oh My! My first phone order was a lovely lady calling from a farm in Georgia. 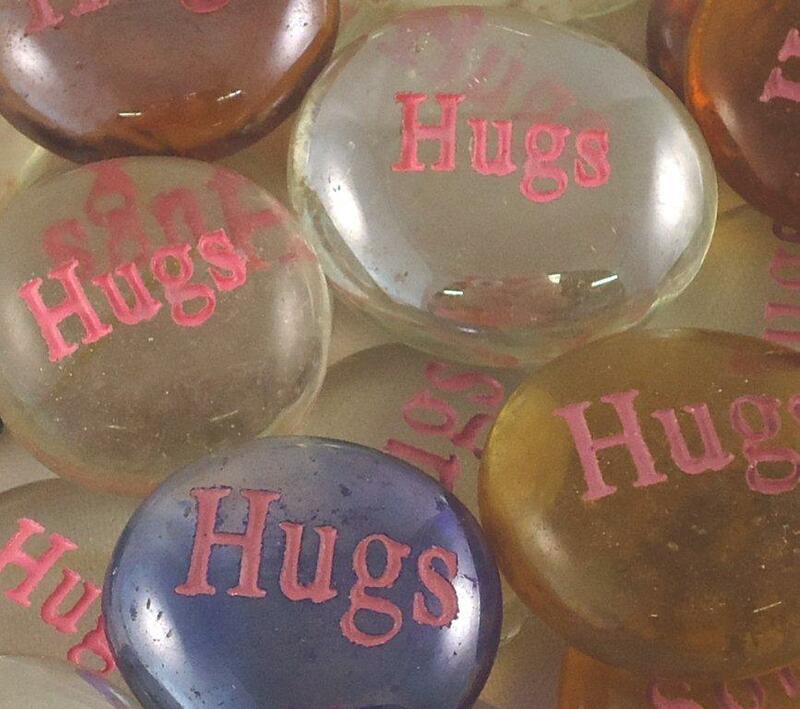 In her thick southern drawl she told me how she’d been unsuccessful in seeking a stone with the word ‘Hugs’ on it that was small enough to fit in a pocket. I told her about our ‘Hugs’ Glass Spirit Stone and her emotional response was very touching. As I took her order information she told me about the tiny town she lives in, her inability to use the internet and how the credit card she used was fifteen years old and she got it when she lived in Kentucky. Even though this information was unnecessary I felt a bond form between us and knew this order would be memorable to me. At the last minute she decided to order a second stone for herself. Woo-hoo! I doubled the order! I knew the order was small but it felt huge since it was my very first one. At the end of the call she told me she’d be checking her mailbox for it anxiously. Later, when I was packing the order I thought about how much the small stone was going to mean to someone and I felt proud to be a part of it.